Back in February, Accelerator HK cohort #1 had its Demo Day. As promised, here is the entire Demo Day video where the six teams made their presentations. Enjoy. Earlier this week we opened the applications for the second cohort of AcceleratorHK, a startup accelerator I co-founded here in Hong Kong. As I broadcast the information out into my network, some former colleagues who never really liked me replied back smugly: “oh you are doing an Accelerator too? I heard there is an accelerator bubble.” Even the guy who I talk to at the gym told me that there are “a million accelerators out there.” Businessweek ran a story today about how the Accelerator bubble is going to pop. An economic bubble (sometimes referred to as a speculative bubble, or a market bubble..) is "trade in high volumes at prices that are considerably at variance with intrinsic values". It could also be described as a trade in products or assets with inflated values. The .com era was a bubble. Crazed investors pumped tons of money into speculative companies and inflated their values to levels not justified by true market conditions. Ditto the US and European housing markets last decade. But accelerators? Not so much. For starters accelerators are cheap to put together (compared to raising $100 million to start your own Venture Capital fund) and usually done with your own money. (Note, no investor money was used to start AcceleratorHK, it is 100% funded by its parent company, Telerik.) Maybe people are referring to the companies going through the accelerators, that the proliferation of accelerators is drastically raising the valuations of all those companies that go through them. The standard practice of an accelerator is to invest $15,000 for 8% of equity, making the book valuation of these early stage companies under $200,000. Far less inflationary to valuations than a “friends and family” round. Actually the proliferation of accelerators are driving down the valuations of early stage startups! Considering that all accelerators operate on the same terms, we are more of a price fixing cartel than a speculative security in a bubble. A few weeks ago I was speaking at Hong Kong’s Barcamp on the topic of the New New Startups Economics. My thesis is that the cost of starting a new business is about 20x cheaper than it was 15 years ago. The cost of going from business plan/idea to your first paying customer is measured in the thousands of dollars, not the millions or hundreds of thousands of dollars. I argued that accelerators are starting to replace the early round of seed capital such as “friends and family”. Since it is less risky and cheaper to start a company and there are more people willing to jump in, the combination of education and capital that an accelerator brings to the table is really the superior model. We have lots of inexperienced, but passionate people out there wanting to start a business in all parts of the world. As Eric Ries says: entrepreneurship can be taught. Accelerators teach entrepreneurship by doing. The best way. Then someone asked me if there are too many accelerators and if I see any contraction coming in the space. I said “No way! 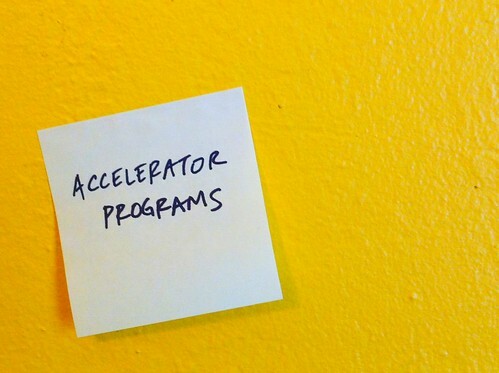 We need more, not less accelerators!” Accelerators are like startup entrepreneurship universities. The world needs more of them. More accelerators mean more startups which mean more disruptive technology. PS, applications close on April 5th for AcceleratorHK. AcceleratorHK, the world’s only startup accelerator focused on cross platform mobile development with HTML5 and Phonegap, has opened its applications for cohort #2 to be based in Hong Kong. The 14 week program runs from May 13th until August 16th, with Demo Day the week of August 12th in Hong Kong. The application is here and will remain open for three weeks, until April 5th. The short listed companies will be lined up for interviews in early April and the final selected companies will be notified by mid to late April. As explained in our “About” page, we will be making a $15,000 (USD) investment in each company in exchange for an 8% equity stake as well as be providing co-working space for the 14 weeks in Hong Kong as well as a program in Customer Development. The best applications are teams of two co-founders, one “business” and one “technical”. The team should have an idea and be ready to do customer development on that idea-even be willing to start over if that is what the results of their customer development tells them. Hong Kong is an awesome place to customer development and validate your mobile app. The place is mobile crazy and everyone has a smart phone. The first cohort of AcceleratorHK graduated on February 6th at their Demo Day. Take a look at how much fun it was preparing for Demo Day. AcceleratorHK Demo Day Prep from Stephen Forte on Vimeo.